The understanding of the seven primary chakras and their significance as energy centers in the body affecting physical, mental and emotional health, dates back as far as 1,000 B.C. One of the most effective ways of keeping your chakras in balance is the use of a meditation singing bowl. These bowls are known by many names--including singing crystal bowls, crystal singing bowls or crystal healing bowls--but all refer to special crystal bowls that, when struck or rubbed with a mallet, emit a note on the musical scale that corresponds to one of the primary chakras. The root chakra is located at the root or base of the spine and is associated with "C" on the musical scale. If this chakra is being obstructed, you may be experiencing feelings of insecurity, paranoia, and confusion. Or, the imbalance may have you questioning your personal or professional purpose in life. The sacral chakra is associated with the musical note "D." This energy center is located just below the navel. When this energy center is unable to work optimally, you could experience sexual dysfunction or fear of emotional intimacy. You may also find yourself becoming withdrawn. A blockage of this chakra can open the door for diabetes and blood cancers. This energy center is associated with the sound of the musical note "E." The solar plexus chakra is just above the navel. If you are experiencing a sense of victimization, have difficulty controlling your emotions, feel unusual stress, or feelings of abandonment or rejection, this could signal an obstruction. This energy center is located in the region surrounding the heart area and is associated with the musical note "F." If your heart chakra is unbalanced, you may experience unusual feelings of jealousy or selfishness. You may have difficulty giving or receiving love unconditionally, and may feel hateful toward those who have betrayed or abandoned you. The throat chakra is associated with the musical note "D." When this chakra is out of balance, you may experience laryngitis, have difficulty speaking up and tend to repress your feelings. Imbalance may also cause you to be prejudiced or judgmental. The third eye chakra is located in the middle of your forehead and associated with the musical note, "A." Blockages can result in sinus and eye problems, controlling behaviors, and egotistical behavior. Located at the very top and center of your head, the crown chakra is associated with the musical note "B." Blockages can show up as emotional problems, feelings of alienation and condemnation. Now that you have a basic understanding of the seven primary chakras and the symptoms of imbalance, you can use crystal singing bowls to affect those chakras where you believe you may have imbalance or obstruction. The OM Shoppe has a wide selection of singing crystal bowls to use in balancing your chakras. Each crystal singing bowl is offered with Free Shipping in the contiguous U.S. and includes a free o-ring and leather striker. The mallet can be used to either strike the bowl or to rub the lip of the bowl to emit a specific musical note. For example, a solar plexus chakra crystal singing bowl will sound the "E" note and help improve your feelings of self-worth, while the third eye chakra crystal singing bowl will emit the musical note "A," and impact your wisdom, commonsense and intuition. A sacral chakra crystal singing bowl will sound the tone "D" and improve your creative thought and sexual health. If you have difficulty in communicating with those around you, the throat chakra crystal singing bowl should be your choice, sounding the musical note "G."
A heart chakra crystal singing bowl will sound the musical note "F," which corresponds to the heart chakra and your ability to enjoy a loving relationship and avoid being overwhelmed by difficulties in life. A crown chakra crystal singing bowl will sound the musical note "B" and help you reach that higher understanding, while ordering a root chakra crystal singing bowl will aid you in gaining a sense of security as it sounds the musical note, "C."
By understanding the impacts of your seven primary chakras, you can more easily identify suspected imbalances or obstructions. Crystal singing bowls allow you to choose just the right musical tones to impact specific chakra needs. All Singing Crystal Bowls for sale by The OM Shoppe are made of the finest 99.99% pure quartz crystal. 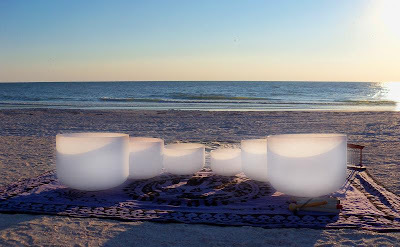 Frosted quartz crystal singing bowls produce a pure, expansive and powerful sound that resonates deep into the body and are available in sizes from 8" in diameter up to 20" in diameter for stocking sizes. The size of the bowl does not determine the note or tone, but larger bowls will tend to sound longer and have lower octaves for a deeper sound.